During the 30-Years-War (1618 to 1648), Bavaria, Austria and Bohemia were engaged in vicious fighting. Salzburg was an independent principality at this time and suddenly realised that it was virtually unprotected and not fortiefied beyond the castle. Prince Archbishop Paris Lodron increased the taxes dramatically, thereby causing a famine. With the money, he rapidly built enormous walls all around Salzburg and fortified the entire city. As a result, Salzburg lost not a single life in the war, whereas Bavaria lost one third of its population. 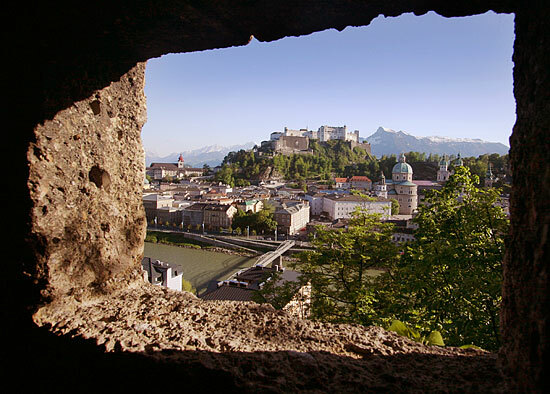 Today, much of the fortification on the Salzburg mountains is still preserved. A nice hike is to walk along the bastions of Basteiweg on the Kapuzinerberg to the Franziskischlössl. Make sure you have proper shoes; the path leads you to some of Salzburg′s most scenic spots. Note the high resolution version of this Salzburg photo.